One pan, one knife, one burner, and nearly infinite variety. If this is "poor," give me another serving, please. A week doesn't go by without another account about how poor people can't afford healthy food and they don't have time to prepare home-cooked meals. The lack of a range/oven also seems to doom them to fast-food and the resulting illness/early death. Just recently I read a story in which a single parent was bemoaning her inability to shop at Whole Foods (due to her low income) and her 12-hour days, and these factors apparently justified feeding her family frozen burritos and fast-food. Many of us, poor or simply not-wealthy, work 12-hour days six days a week and we can't afford to shop at Whole Paycheck, oops I mean Whole Foods, either. In other words, the challenges of preparing healthy home-cooked meals are nearly universal. We also read that poor people don't have easy access to supermarkets, so they are forced to buy Pop-Tarts and other junk food at the corner liquor store. In multi-ethnic America, this account simply doesn't ring true, because "poor" neighborhoods are precisely where ethnic groceries are located: Hispanic, Asian and halal groceries abound in every ethnically diverse city and town, i.e. virtually every city/town in America. I have found ethnic markets in small towns in Iowa, for example. We shop almost exclusively at ethnic markets in "poor" neighborhoods, because the quality and price are superior. You want quality chicken? Shop at a halal. You want quality fresh vegetables at reasonable prices? Shop at an Asian or Hispanic market. These markets are generally quite competitive, and they buy their produce carefully because their customers are picky about price and quality. Not only that, shopping at these local ethnic markets is fun and interesting. You can learn a lot by asking questions and being observant. A smile goes a long way and pretty soon you'll be welcomed as a regular. The narrative that only having a cooktop dooms you to junk food is also false. All anyone needs is one source of heat and a cheap wok to make an essentially limitless array of fine cuisine that rivals the fanciest restaurant fare. The fast-food/junk food diet enables the frazzled adult to rush home and turn on the TV or Facebook--both of which are completely deranging. The more exhausted one feels, the more important it is to slow down, focus on the present and engage in a calming activity that generates right mindfulness and positive feelings--like cooking a meal. Yes, I watch TV and have a Facebook account, just like I drink wine or beer--in moderation, and with strict limits (15 minutes of social media once a day works for me--and my email program is closed most of the day, too). This is the only way to avoid being completely deranged by media, messaging and social media. So when I'm frazzled at the end of a long and trying day, here's a quick, healthy meal that's as good as any fancy restaurant fare. If some hot-shot TV chef showed up at our house, I would make him/her this dish absolutely confident it would meet every standard of excellence. In haute cuisine (East and West), this would include a balance of contrasting tastes, textures, colors and mouth-feel. 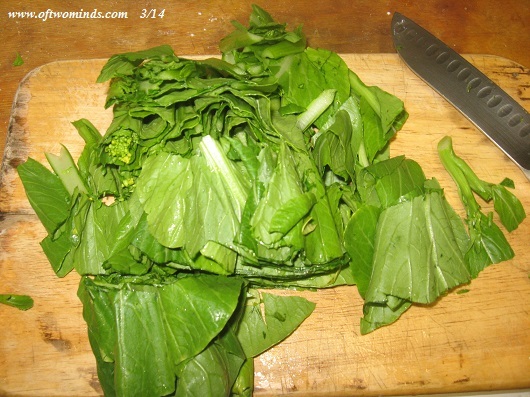 Stir-fried dishes are fairly forgiving; you don't have to get too exacting in how you cut the leaves. Add the rest of the vegetables and continue stirring until they're tender (not overcooked, not undercooked). 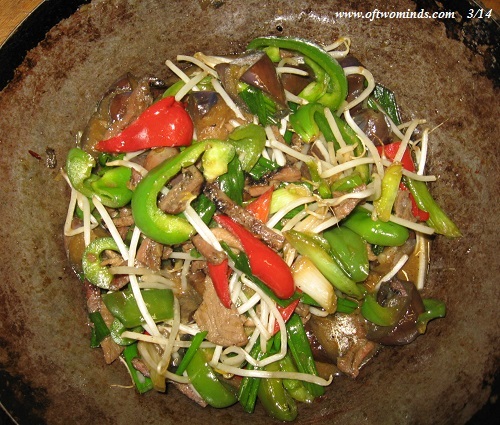 You may need to add a bit more cooking wine or fish sauce, depending on the quantity of veggies. Here's the finished dish, ready to serve with whatever kind of rice you favor: basmati, jasmine, short-grain, brown, etc. If you start the rice pot (or pressure cooker, in the case of brown rice) when you begin prepping the veggies, the rice will be ready when your dish is done. This dish meets all the requirements of healthy, high cuisine. It has a nuanced balance of flavors, textures and colors. 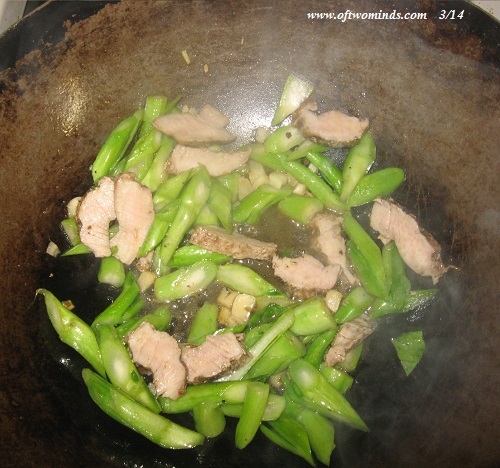 And it required only one pan, a seasoned wok which only needs to be rinsed, one burner and one knife. 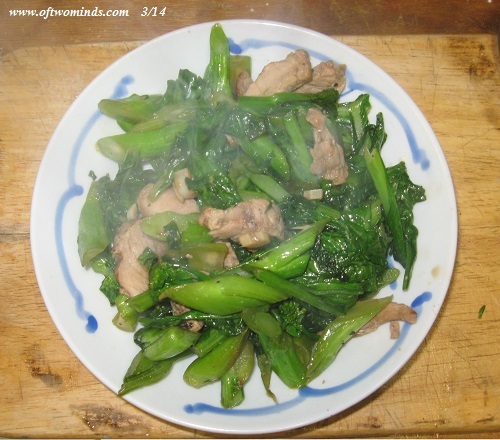 Two fast-food "value meals" cost $12 (and leave you feeling ill), two servings at a Chinese restaurant costs $15, and this home-made meal costs a few dollars: so which one is the most affordable as well as the healthiest? If we consider cooking a form of mind-clearing positive activity, then the benefits extend beyond price and nutrition. Thank you, John M. ($5/month), for your exceptionally generous re-subscription to this site -- I am greatly honored by your steadfast support and readership. Thank you, James K. ($5/month), for your wondrously generous subscription to this site -- I am greatly honored by your support and readership.